Provide heating and cooling in small, enclosed spaces with a single self-contained, through-the-wall air conditioner. 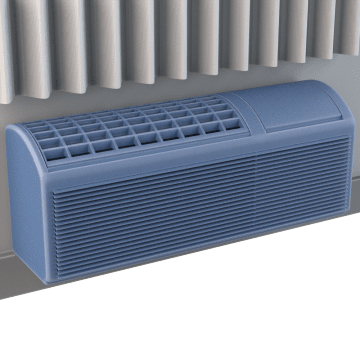 Packaged terminal air conditioners (PTAC) are all-in-one units with a built-in compressor, so there's no need for external wiring, refrigerant lines, or landscape barriers. Install them in a cutout of an exterior wall and control them with a remote, wall-mounted thermostat. They have a fully insulated cabinet for quiet operation and are oriented horizontally, so they're often placed below windows. Good for hotels, multi-unit buildings, and room additions.